The training and resources you need to become an airline pilot. Complete the program in nine months (from zero time) and start flying as an airline pilot in about two years – proven by thousands of graduates. The fastest path to becoming a major airline pilot starts at ATP. With airline-oriented, total immersion training from day one, you will graduate from the Airline Career Pilot Program in 9 months (from zero time), earning your Commercial Multi-Engine pilot certificate with Certificated Flight Instructor certificates. After graduating the program, you receive a guaranteed flight instructor job with ATP, where you can earn up to $42,000 annually with airline tuition reimbursement and gain the necessary flight experience to reach airline hiring minimums of 1,500 hours. During your time as a flight instructor, at 500 hours total flight time, you can begin earning airline sponsored tuition reimbursement, if qualified. After about 18 months as an instructor, you will be at airline minimums and ready to start flying as an airline pilot with one of ATP's 21 regional airline partners. Whether you have your sights set on American Airlines, Delta Air Lines, or United Airlines, ATP's airline partners offer you a direct path to the major airlines. Airlines have selected ATP as a preferred training provider, giving you more opportunities of who to fly for and in many cases a direct path to a major airline. Thanks to the strong track record of ATP-trained professional pilots, both Sallie Mae and Wells Fargo offer their lowest-rate undergraduate student loan products to ATP flight training students. ATP is the only flight school that can get you access to these competitive loan products, which in most cases cover the entire cost of flight training for qualified borrowers. ATP brings high quality, accelerated flight training to more pilots in more locations than any other flight school. ATP offers a convenient housing option. You get a shared bedroom in an upscale, furnished apartment with all utilities included. As an Airline Career Pilot Program graduate you are guaranteed one of the most desired flight instructor jobs in the country, where you can earn up to $42,000 annually with airline tuition reimbursement and build flight experience. As an ATP student, you will have access to the resources you need to be successful. From comprehensive training materials to the nation's largest, best maintained training fleet, you will be provided with the support required for successful career training. 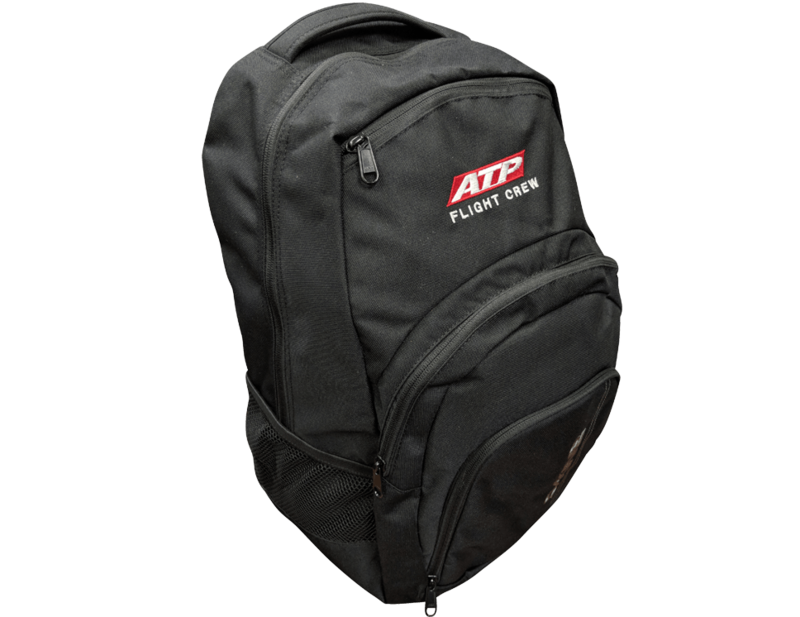 Pack your official ATP Flight Crew Backpack with the supplies you need for the Airline Career Pilot Program. After scheduling your start date, ATP will send you a flight training bundle that includes the books, reference material, and study guides a student pilot needs to effectively pursue an airline pilot career. The world's largest flight training fleet with factory new Garmin G500-equipped Piper Archers and Seminoles, and technologically advanced Cessna 172s. When you train with ATP, you train using the latest technology. Your iPad gives you access to courseware, charts and approach plates, and test prep that you'll use in training. Airlines use electronic charts in their flight decks and you'll use them during your pilot training. Train in the Best Aircraft Fleet of Over 365 Owned, Not Leased, Aircraft. ATP’s fixed cost pricing includes flight training in excess of FAA Part 141 minimums to provide a realistic amount of training required by most pilots. Logged flight times may vary slightly due to flight check times and other considerations. I loved the program [Airline Career Pilot Program] and how structured it was and to this day, I am glad that I chose ATP versus some of the competitors. Family of ATP alumni and Airline Career Pilot Program graduates are eligible for a discount. Classes are offered every month. Contact us to check availability. Airline Career Pilot Program policies, payment schedules/financing, and attendance. Steps to enrollment and what is needed to meet admission requirements. Starting your pilot training is exciting and there are multiple steps in the process. At ATP Flight School, our job is to guide you through these steps and make your flight training an enjoyable experience. The information in this section will help you get fast answers to most of your top flight training questions. How should I prepare for my start date? What should I bring to training? ATP's Airline Training Programs prepare students for airline pilot careers with an emphasis on nationwide flying experience in multi-engine aircraft. Items to bring to training for ATP's Airline Career Pilot Program. This list pertains to students enrolled in ATP's accelerated flight training. You can become a pilot. Learn how to become a pilot and get your pilot license, including requirements, eligibility, how long it takes, and cost. Join the conversation on AirlinePilot.life, the online community where you can ask actual airline pilots all of your flight training and airline career questions. ATP was the perfect decision to start my airline career. The fast pace along with the structure made it easy to stay on track and make significant progress. I know some people who started the same time as me and still are working on instrument while I’m at Compass Airlines. To anyone who wants to be an airline pilot, I always recommend ATP. To start, I would simply say I would not be where I am today without the training I received from ATP. The ATP program sets you up for the fast-pace training I encountered at Endeavor Air… I have met several pilots on the line that have been through ATP and I continue to promote ATP as the best flight school. If flying is your dream, ATP will get you there. Over ATP graduates have been hired by airlines in the last 12 months. Congratulations to these ATP graduates who have achieved the next step in their professional pilot careers. ATP is proud to have the highest ratio of airline placements to students of any flight school, aviation college, or flight academy. The Airline Career Pilot Program far exceeds any other flight academy’s capabilities and offers you the most efficient path to a successful airline pilot career. The world’s largest flight training fleet safely maintained by ATP's unparalleled nationwide maintenance department. Guaranteed instructor job after training, earning up to $42,000 annually with airline tuition reimbursement. Professional airline-oriented training for over 35 years. Airline sponsored tuition reimbursement (if qualified) makes your goal more obtainable. Fixed cost based on realistic flight times that exceed FAA Part 141 minimums — others quote a minimum cost. Housing option available with no lease commitments. Fast track training – zero experience to airline pilot job in about two years, in most cases. ATP offers full financing solutions for successful career training through multiple lenders, if qualified. One proven path that moves you faster, further.